Discounted Disneyland� multi-day tickets available for purchase at our front desk! With low rates and many amenities, you're ensured a great stay at the Best Western Plus Pavilions hotel. We are conveniently near Disneyland, Angel Stadium and Anaheim Convention Center. This Anaheim hotel offers abundant amenities - enjoy free Wi-Fi, cable satellite television with the Disney Channel� and HBO�, microwave, refrigerator, coffeemaker and most of all, clean, 100% smoke-free well-appointed rooms. Please note that we are not able to accept pets during your stay. Just a few blocks from our hotel, you can experience the magic of Disneyland�, Disney's California Adventure� and Downtown Disney�. Best Western Plus Pavilions offers the perfect location for families to enjoy the area, lots of fun and adventure. Love sports? Anaheim Stadium, Arrowhead Pond of Anaheim and Honda Center are all within a few miles of the hotel. With Disneyland being so close to our hotel your fun starts here - the area is home to a variety of restaurants, shops, malls and entertainment venues you'll never have to travel far for movies, meals and merchandise. Those who are in town for business, your events are ensured a productive trip, as Anaheim Honda Center is nearby. Traveling to the airport is easy - John Wayne Airport is just 15 miles away. Anaheim is filled with adventure, so after a busy day, lounge and unwind by our sundeck or play in our outdoor heated pool and hot tub. This hotel also offers many other on-site amenities, including free parking, 24-hour front desk, and complimentary computer access, a local shuttle to Disneyland Resort during park hours, dry cleaning and Disneyland Resort Park Hopper Tickets available for purchase. 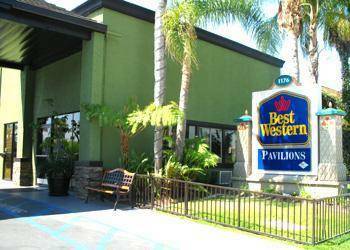 For a memorable and affordable trip to the Disneyland area, make a reservation at the Best Western Plus Pavilions today and save! Enjoy your stay. �From: The north. Follow Interstate 5, take Harbor Boulevard Exit. Travel south to Katella Avenue and turn right. Continue for two blocks to the Best Western Plus Pavilions. �From: The south. Follow Interstate 5, take Harbor Boulevard Exit. Travel south to Katella Avenue and turn right. Continue for two blocks to the Best Western Plus Pavilions. �From: The east. Follow Interstate 91 freeway west to Interstate 57 South. Exit on Katella Avenue and turn right. Continue for three miles to the Best Western Plus Pavilions. �From: The west. Follow Interstate 91 freeway east to Interstate 57 South. Exit on Katella Avenue and turn right. Continue for three miles to the Best Western Plus Pavilions.